In Germany, football clubs are intertwined with their community, and perhaps no club embodies that connection better than FC Schalke 04. Fuelled by passionate support from a local area proud of its coal-mining roots and traditions, Schalke have grown to become one of Germany's best-supported and most successful clubs. 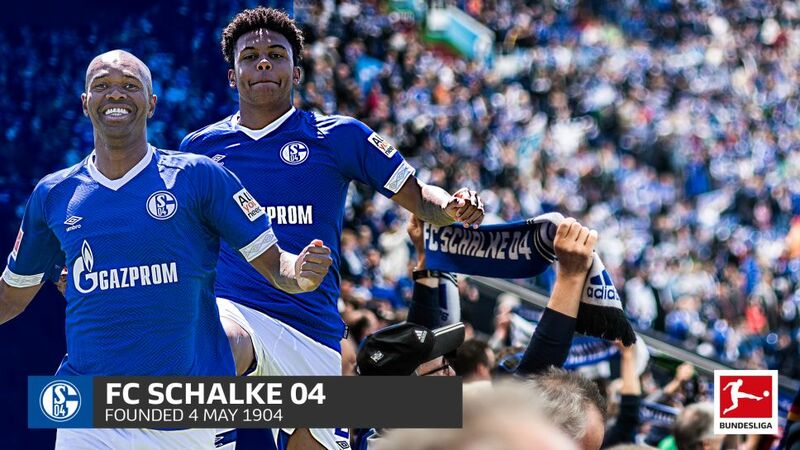 In 2001, for four glorious minutes, Schalke were Bundesliga champions for the first time. Then, in the blink of an eye, the title was taken away from them in the cruellest possible fashion, as a goal from Bayern Munich's Patrik Andersson at Hamburg, in the final seconds of the season's last game, gave the Bavarians the championship and condemned Schalke to second place by a single point. Though they were on the wrong end of the most gripping title race in history, the Schalke team of that year have become club legends, and even earned the nickname “Meister der Herzen” – The People’s Champions – from the rest of German football. FC Schalke 04’s earliest presence as a sports club dates back to its founding as Westphalia Schalke on 4 May 1904 (hence the 04 in the club’s name), and their first kit was red and yellow. However, after a series of mergers with other sports clubs alongside various name changes, Schalke’s football department broke away in 1924 to form the club as it is currently known, doing away with their previous colours and starting afresh with a blue and white strip, soon afterwards becoming known as the Royal Blues. Around the same time as the Royal Blue moniker caught on, Schalke also gained another nickname: Die Knappen, an old German word for miners, on account of the strong support they received from local mine workers in Gelsenkirchen that made up both their fanbase and playing staff. Ernst Kuzorra, perhaps Schalke’s most famous player and the man whose name appears in the club’s address, was a colliery worker before playing for the club full-time. German clubs’ commitment to giving young players a chance to impress in the Bundesliga is well known, but few clubs have a better record in this department than Schalke. The Royal Blues academy – known as Die Knappenschmiede – has been the classroom for countless star names to have emerged since the turn of the century. The likes of Manuel Neuer, Mesut Özil, Julian Draxler, current captain Ralf Fährmann and former centre-back Benedikt Höwedes are just some of Schalke’s academy graduates to have gone on to the very top of the game. Fast forward three quarters of a century from Kuzorra's heyday and Schalke are on the brink of winning a first ever European competition. Under Huub Stevens, The Royal Blues get past Valencia and Tenerife before facing Italian giants Inter Milan in the final. They win the first leg 1-0 courtesy of a Marc Wilmots goal and lose the second leg at the San Siro by the same scoreline, but four successful penalties out of four and a save from goalkeeper Jens Lehmann in the shootout was enough to win the trophy and cement Stevens’ status as the club’s “Jahrhunderttrainer”, “Coach of the Century”. The setting: Signal Iduna Park. The occasion Dortmund vs Schalke, Matchday 13 of the 2017/18 season. A quarter of the game in and Borussia were 4-0 up and 80,000 fans in black-and-yellow were already thinking about how they'd run this into their Royal Blue friends and colleagues. Then came the second half, when the world seemed to turn on its axis. Schalke pulled one goal back, then another and then another to trail 4-3 heading into injury time, when up popped the aforementioned Naldo to crash in a header and complete what surely must be the most astonishing comeback in Bundesliga history. In the dugout that day was Domenico Tedesco, appointed Schalke boss in the summer of 2017 as the second-youngest head coach in Germany top-flight history behind Julian Nagelsmann. Appointing Tedesco turned out to be a masterstroke, as the young coach showed tremendous tactical nous to get the best out of players such as Leon Goretzka, Max Meyer and the evergreen Naldo. He was also not afraid to make tough decisions, taking the captaincy from World Cup winner and local favourite Höwedes and sanctioning his departure for the greater good of the team. A first second-place finish since 2012 and a return to the UEFA Champions League was the rich reward for Schalke’s taking the plunge on one of Europe’s brightest minds. Another well-known academy graduate is a young man currently impressing in the first team. USA international Weston McKennie is one of the club’s prized assets, having joined the academy in 2016, he reached the semi-finals of his first U19 Bundesliga season before successfully making the leap to the first team. The Texas native is also the latest in a growing list of American players to have represented the club, joining such names as Haji Wright, Jermaine Jones, Chad Deering, Tom Dooley and current Huddersfield Town coach David Wagner. Schalke’s traditional home, the Parkstadion, is remembered fondly by the fans, but its replacement, the VELTINS Arena, is one of the finest arenas in the world. Atmospheric, modern and innovative, it has a fully retractable pitch that allows the stadium to be used as a concert venue while avoiding damage to the turf. The ground was also the venue for the 2004 Champions League final and hosted five games in the 2006 FIFA World Cup. Schalke fans, whose noise makes it one of the most intimidating grounds in the division, have a wonderful stadium to call home. Click here for the latest Schalke news and features!